The area of Mount Baker in eastern Seattle, just south of I-90 and the Murrow Bridge boasts some fabulous waterfront running. There are some great options here for a shorter or fairly long run. At the south end, start in 300-acre Seward Park, where there’s a paved, car-free loop road around the park on Shore Loop Rd. There are great views to Lake Washington and Andrews Bay. There are also a few miles of trails in the interior that are good for running. For more, the stretch along Lake Washington Blvd. 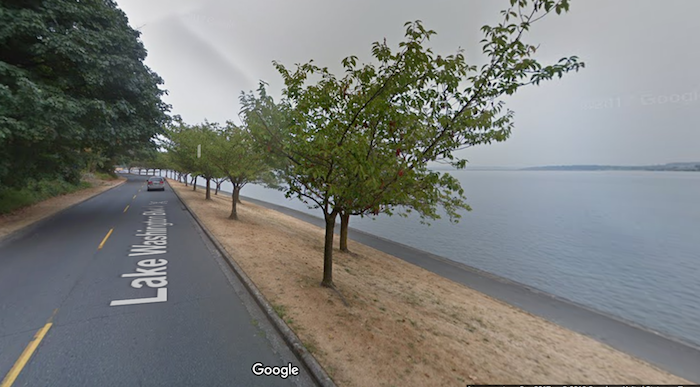 north to I-90 has fantastic waterfront views and a dedicated sidewalk/path. It’s 3.4 flat miles from Seward Park to Colman Park, just short of I-90. So a roundtrip including the Seward loop is a cool 9.2-miler! For variety, you could loop back through Olmsted-designed Colman Park (narrower trails through woods) and Mount Baker Park for 0.6 miles total. A tree-lined pathway leads to popular Mount Baker Bathing Beach — about 0.6 miles. And a final note: there IS agood trail/bike path along the north side of the Lacey V. Murrow/I-90 Bridge, leading to Mercer Island, for 2 miles. One can even continue another 3 miles to Belleveue, using the I-90 Trail/Mountains to Sound Greenway Trail. So that’s 5 miles one-way…and take the bus back! It’s more bike path-y, but still runnable.